As a brand, Tesla Motors has made its name in resource-consciousness. Now, it is extending that philosophy past its electric cars to your smartphone accessories. 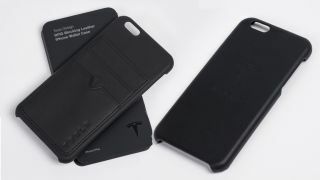 Tesla's officially-licensed iPhone 6 and 6 Plus phone cases are not just made from the same leather that lines the interior of its luxury vehicles, but use the exact same material left over from manufacturing its car seats in an effort to reduce waste. Starting at $45 (approx. £30/AU$63), Tesla's recycled seat upholstery cases will let iPhone users be able to keep a piece of their vehicle with them at all times. For $50 (approx. £33/AU$70), an upgraded version with RFID-blocking card slots is also available, for those wanting to skip buying a wallet altogether to reduce their leather footprint. While not all made with recycled car parts, other Tesla-branded accessories are available on the company's online store, including a "sustainably sourced" alpaca wool scarf for those long drives with the windows rolled down. Speaking of phone cases, we hunted down the absolute worst ones we could find.